Fashion Jewelry Fulfillment - Coast to Coast Fulfillment, Inc.
Coast to Coast Fulfillment specializes in fulfilling orders for fashion jewelry wholesalers and retailers in the USA. Each week we pick, pack, and ship thousands of fashion jewelry orders destined for retail stores, chain-store distribution centers (DCs), and for consumers (B2C). If you are a large producer or designer of fashion jewelry or costume jewelry, please contact us to find out how can help you grow your business through better fulfillment services. 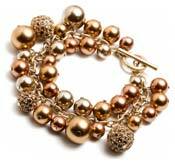 Why is Fashion Jewelry Fulfillment Special? Unlike fulfillment for other products, our clients' inventory is often completely replaced with hundreds of new designs each week, when we assign a unique stock number (SKU) and distinct picking location to each design. Then, we pick, pack and ship out virtually the entire inventory in less than three business days from its arrival. Of course, we also fulfill orders for "classic" lines of costume and fashion jewelry and accessories. Since the same jewelry design can have several sales prices, dependent on its sales channel, we match every unit of incoming merchandise with each purchase order. Then we generate corresponding invoices and payment data. If you are a large designer or producer of fashion-forward jewelry or other products, contact us now for more information. "I wanted to take a moment to thank you for all your help in making this transition possible. Our business has flourished since we began our relationship with Coast to Coast. You allow us to focus on what we do best. We appreciate everything you have done and look forward to continuing to grow our business! Thanks again."